September is officially Fall in my mind, which means I no longer have to be as ashamed to wear sweaters in 70 degree weather (lol). But in reality, we are experiencing some amazing Fall temps right now in MN. And, although it may still be warm where you are, those chillier days are right around the corner! So, it feels like the perfect time to do an affordable cardigan roundup! Cardigans are the bread and butter of my Fall & Winter wardrobe. They can easily dress up or down an outfit and are the perfect layering piece. Plus, if you have few neutral go-to cardi’s, you have endless outfit combinations! I’ve picked my top cardigans you NEED for Fall all under $80! The Cozy Cardi : BY FAR, the #1 loved cardi on the blog right now. And, I’ve only shared it once on Instagram. It’s just that good! 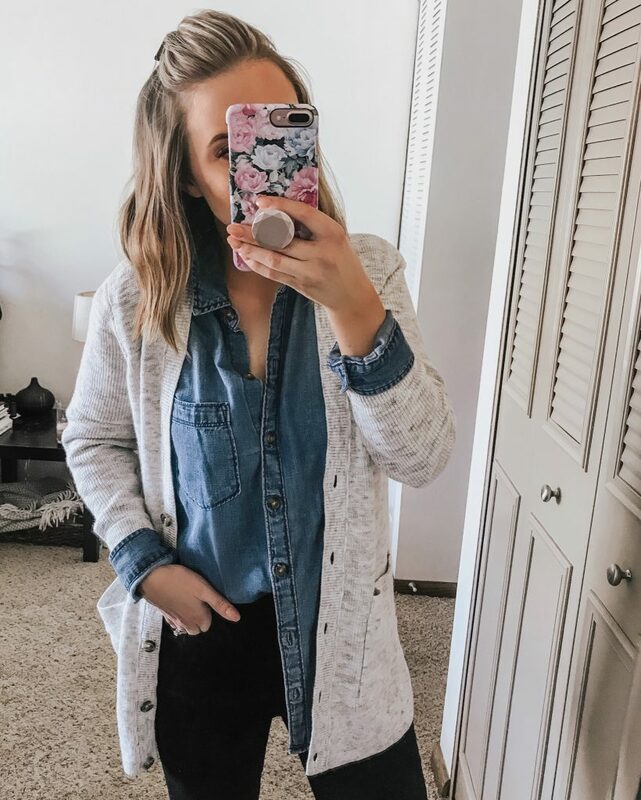 This cozy cardi looks just like Free People but is actually from one of my fave online boutiques – ChicWish. They have tons of great fall staples at affordable prices. And, I’m continually impressed by their quality! I may have included another one of their cardi’s below because they’re staples in my closet! I’m wearing XS/S here – definitely an oversized fit! The Transition Season Cardi: I’ve shared this cardigan from Nordstrom numerous times, including in this blog post. I love it so much I have it in two colors! It comes in regular and petite sizes, and I got my true size (SP). 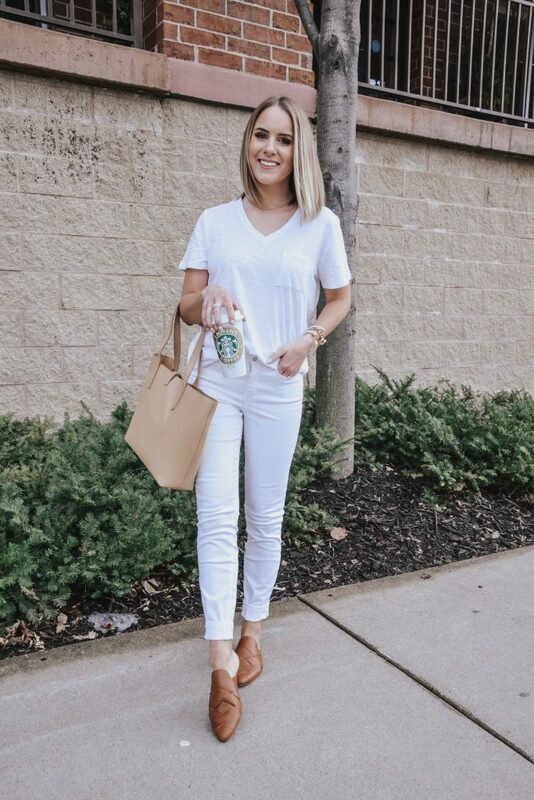 It’s the perfect weight for transition season (Summer to Fall; Winter to Spring) and is one that can easily be worn throughout the year! The Perfect Layering Cardi: This cardi has been a go-to of mine for the last two years. I purchased it in black and green last year, and this burnt orange color this year. It’s very affordable, coming in at $49 and comes in a ton of colors. Because this cardi is on the lighter side, I like to layer it over long sleeves, like I did with this chambray shirt. I would suggest sizing down one – wearing XXS here for reference. The Chic Cardi: Say hello to the cardi of my dreams 😍. This cardi had been on my wish list all last year so I jumped at the opportunity to pick it up in this gorgeous burnt orange color. It also comes in black, grey and pink. Another gem from ChicWish, this one is perfectly oversized and perfect to dress up or down! I’m wearing a XS here and would say it fits TTS. The Staple Cardi: I always need one boyfriend cardi in my closet. Why? Because it is the casual layering piece to have since the style goes with everything. This one is perfect to wear to work (calling all teachers!) and wear on the weekend. I call that a win-win! Wearing XS here for reference. The Second Cozy Cardi: Because you can never have too many cozy things, right?! This one is super soft, and I’m not lying when I say I’ve slept in it – lol! It’s going in and out of stock in the white color but is still fully stocked in the maroon (which is perfect for Fall & Winter!). If you had to choose one – which cardi would be a staple in your closet? Now, for a little life update! If you follow me on the ‘gram, you know that Kev & I moved to the suburbs last weekend! We loved living in the city, but wanted more room. And, when we found an apartment that overlooked a pond and wooded area, we jumped on it. Those of you who know Kevin personally know that he is living for our porch right now! Mr. Outdoors! Besides the move, August was a horrible month for me in terms of migraines. I had three really bad migraines with numerous headaches in between. This is not normal! I’ve mentioned before that I have chronic headaches and migraines, but three in one month gives me flashbacks to high school. A time I care not to relive if I can help it (lol)! Knock on wood, they’ve been a lot better this month so far, and I’m crediting that to the move and taking a lot more time off from work than I normally would. When work doesn’t feel like “work,” it’s hard to remember that you need a mental break for your general well-being. Taking some time away from staring at a screen constantly also likely has something to do with it. So, I’m back to our regularly scheduled posts, and have made some lifestyle modifications so that hopefully this type of headache cycle doesn’t happen again! And, to end on a happy note! I hit 30K Instagram followers and 2M monthly Pinterest views last week and could not be more excited 😆In reading this blog, shopping from my links, commenting and engaging with me, you’re supporting a dream. And that means everything to me! Thank you for all of you support this last year, and I know this is only the beginning of our fashion journey together! They come in the denim wash, a black, camo and white wash as well. 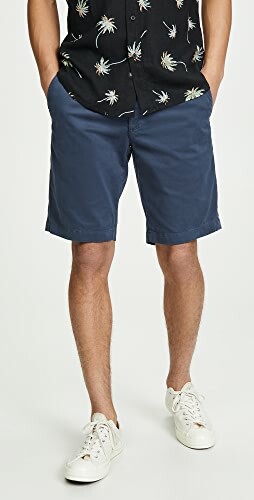 They are currently $78, which is great deal when you consider how many ways you can style them! I did get the XS but could have sized down one more to XXS as they don’t have petite sizes, and these are a bit roomy! However, I like them enough not to return them 😉. I’m wearing a XS in the top as well, and it fits true to size. I would suggest sizing up if you’d like it a bit longer. 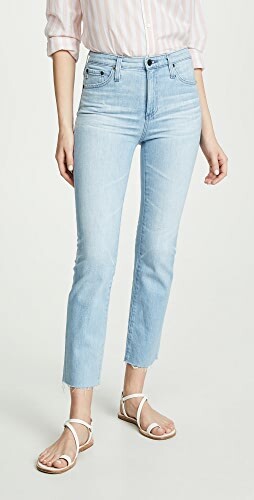 It has more of a cropped fit (but looks great with high waisted denim!). 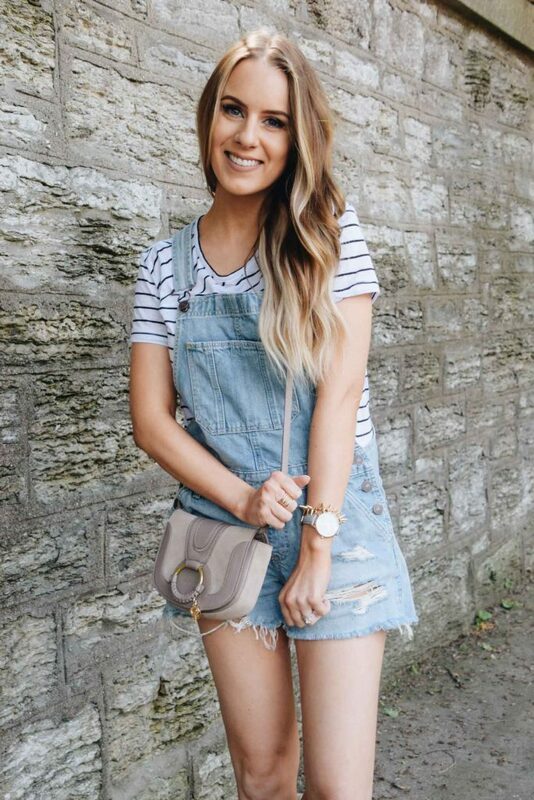 I kept my accessories simple since these overalls are pretty casual and went with a pair of studs like these, my favorite watch and my fave under $20 slides (currently $16 with code SWEET at checkout)! If you follow me on the ‘gram, you’ve likely seen these sandals more than a few times! They’re one of the comfiest pairs I own and are a steal for the price! I’ve been wearing them since our Sanibel trip with no issues because the straps are so soft 😍. I would suggest sizing up if you’re between sizes! I’m normally a 6.5 and went with a 7. This week (well, Monday) marks one YEAR since starting this blog! In some ways, I can’t believe it’s been a year… but in others I can’t believe it’s been only a year. LOL! So many good things have happened and are yet to come. I’m working on some great content for the coming months and have exciting collaborations lined up for you all! Please know that your support of my blog means the WORLD to me. There is no way I would be able to do what I do, or call it my business, if it were not for all of your support! Although your subscribing, liking, commenting, following, sharing, buying through my links/site may not seem like a lot, it all adds up big time! Without it, I would not be able to keep creating great content for you all and keep you inspired! So THANK YOU a million times over for all of your support this past year and in the years to come! 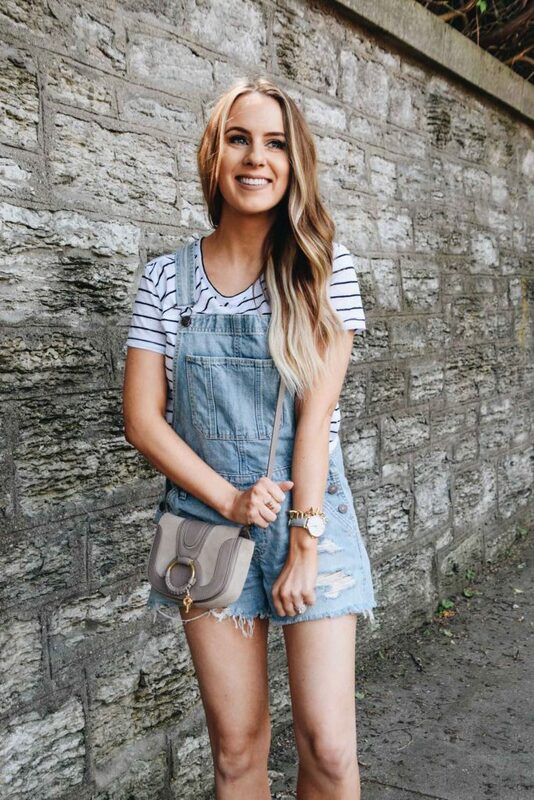 My Favorite Casual Dress for Summer + Sales! After a brief hiatus, I’m back! Last week, I traveled back to Madison for one of my best friend’s bachelorette parties. I spent an extra few days catching up with my parents and old friends too! It was so nice to catch up with everyone but went way too quickly!! When I got back, I decided to take a few days “off” to recoup since I haven’t taken any time truly off in months. It felt so good to get that necessary me-time in! And, now that I’m back from vacay mode, the Memorial Day Weekend sales are in full swing! 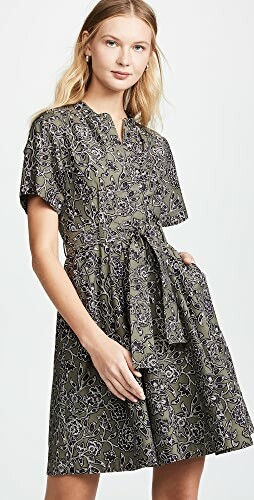 This tank dress from LOFT is on sale 40% off making it right over $41! It’s from their Lou & Grey Signaturesoft line, which rarely goes on sale so I’m excited to share it with you all!! I’ve owned several things from this line, and they’re literally the softest pieces of clothing I own. 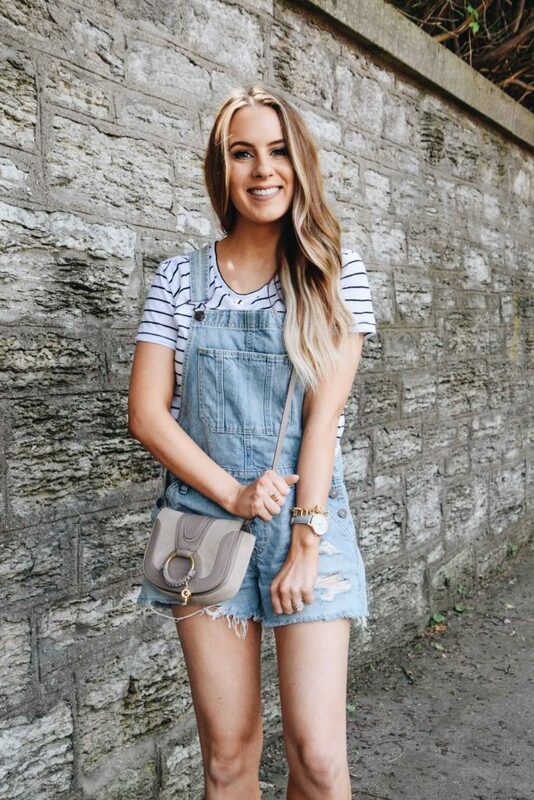 This casual dress does not disappoint!! The straps are thick enough to wear the dress on its own to work during the summer, but it’s casual enough to wear on the weekend as well. It doesn’t come in petite sizes, but it falls right above my knees, which is perfect for me! 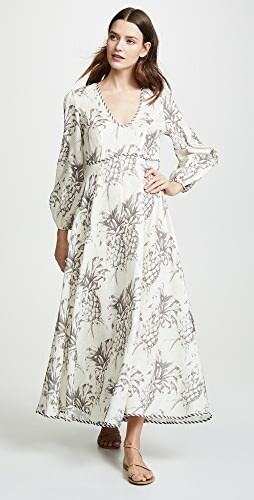 I’ve seen it on taller women, and it’s still long enough to be appropriate for them too (not sure if LOFT even sells anything that would be considered inappropriate lol!). I got an XS and feel it fits true to size. Like I said, you can wear this dress on its own or layer it like I did here. 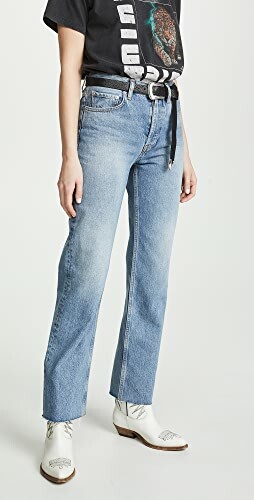 It’s super cute under a jean jacket (also on sale) and looks good with a jean jacket tied around your waist. I also think it would be super cute with a flannel tied around your waist! Pro-tip: tying a belt, jacket etc around your waist can add shape to a shift dress like this if you think it looks too “oversized” on you! LOFT is having a 40% off site wide sale for Memorial Day with code “LONGWKND” – Here are some of my top picks! Happy Monday everyone! I hope you all had a wonderful Mother’s Day weekend! Kevin and I had a great time out Saturday. We ended up not being able to decide where to head to dinner so we’ve settled on Burch for tonight (today’s our actual anniversary!). And we spent yesterday relaxing, which was much needed! I recently picked up this lightweight $50 top from LOFT. It was one of those tops that looks 100 times better on than on the hanger, and I instantly fell in love with it! The style is perfect for work and the criss cross back brings a trendy twist to an otherwise classic style. The back doesn’t go down too far making it both appropriate for work and great for wearing out. The description says it’s a “sweater”, but I feel it’s much more lightweight than you’d typically think of a sweater being. It’d be perfect for those times when the AC is blasting in the summer, and you wish you had something a little heavier in the office! 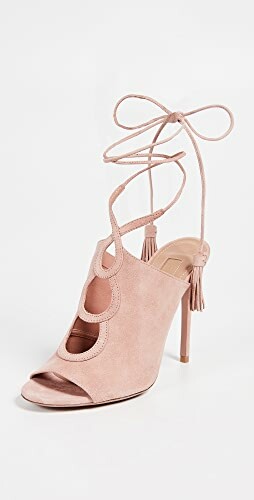 It comes in two colors, and I opted for the blush color since it feel so springy. In terms of sizing, they did not have petite sizes available in store so I went with a XS, and it fits well. However, it does come in petite and regular sizes. I probably would’ve gotten petite had they had it so it was just a bit shorter (I’m 5’2″ for reference). 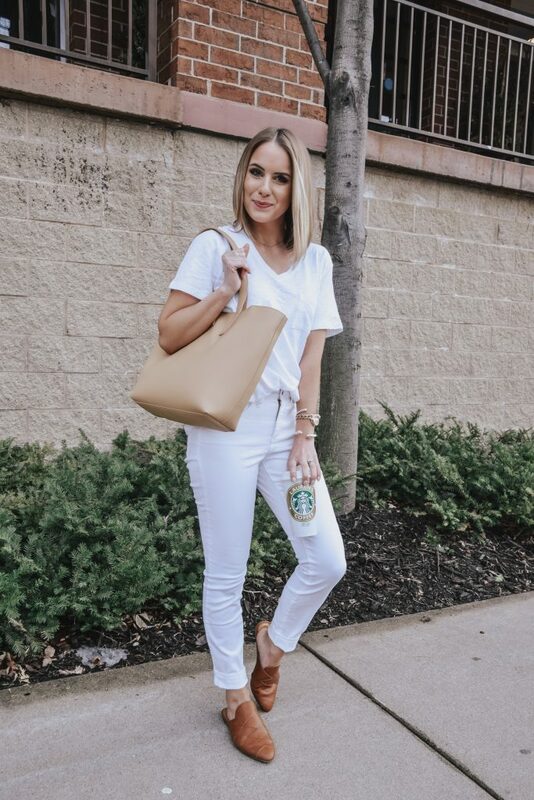 This outfit is definitely ready for happy hour. 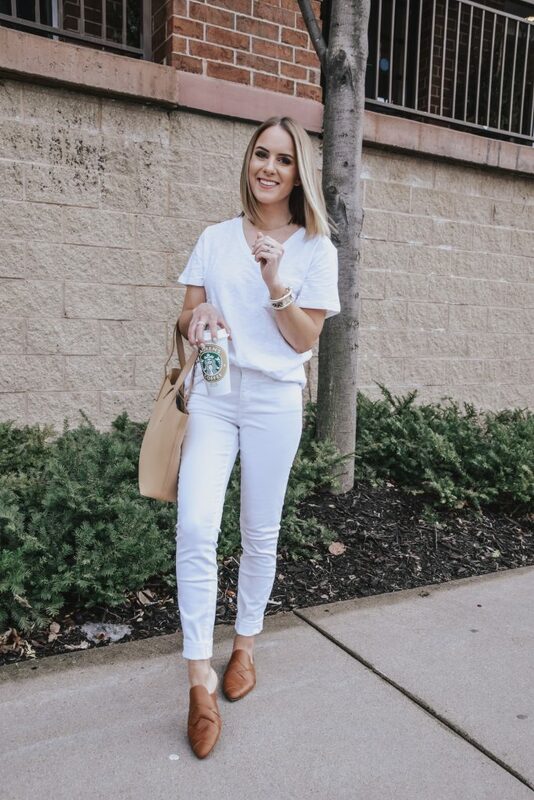 These white jeans are my current faves – I talked about them in this post as well as this one! They’re so so comfy and feel like jeggings. I’d suggest sizing down one as they do stretch. These wedges are also some of my favorites recently! Super soft leather and come in a ton of colors. 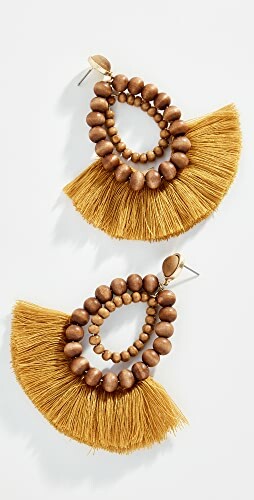 They’re also under $80 but feel and look much pricier! If between sizes, I’d size up a half size. I typically wear a 6.5-7 and got a 6.5 and am right on the edge! 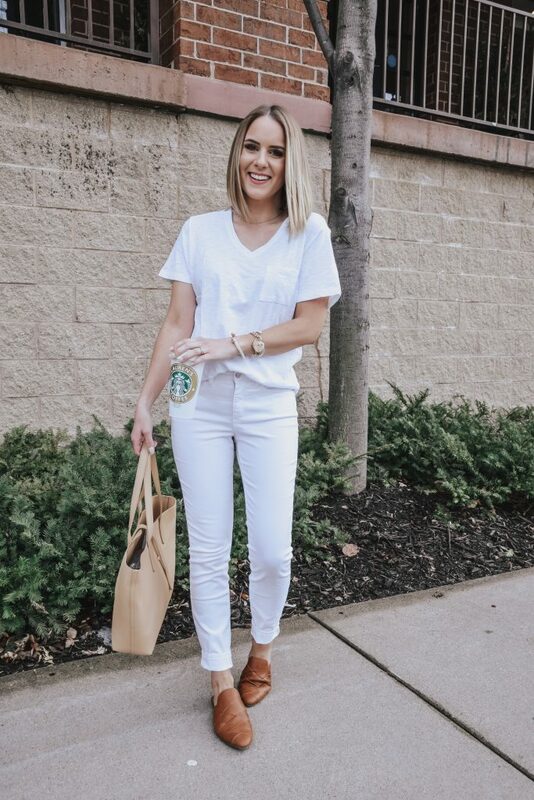 To make it more work appropriate, you could easily pair this top with a pair of pants like these white ones or these gray ones. 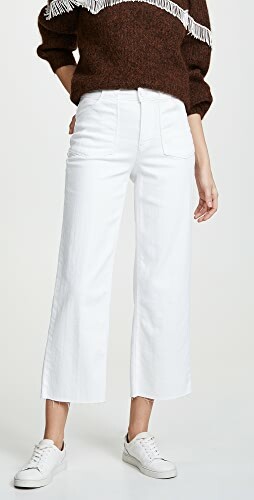 I’ve gotten several work pants from LOFT and love the quality (and the petite sizing can’t be beat)! You can never go wrong with a pair of slim fit work pants. So flattering and chic! Also, I’ve linked the “Marisa” fit pants but if you’re curvier, go for their “Julie” fit. And, because I know open-toed shoes aren’t allowed in every work place, these pumps are perfect for almost any occasion and come in so many colors. They’re a bit pricier but will last forever! These are very similar but have a thicker heel. This little bag is perfect for wearing out and about, and it’s a total designer dupe. It’s surprisingly big – I can fit a wallet, phone, make up and sunglasses no problem. For work, I love my Kate Spade and Hammitt tote bags. Both are great quality and large enough to fit a laptop, tablet, wallet etc. They’re also great for travel! I’ll end the post with my Instagram quote from this morning – “Focus on being productive instead of busy.” Here’s to a productive start to the week!